I found myself with a cup of leftover mashed sweet potatoes. I decided to play around and see if I could turn them into a dessert. 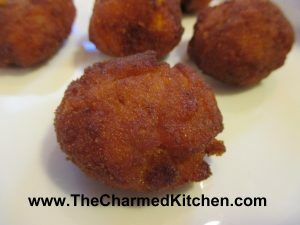 I added eggs, flour, baking powder and a few other things, fried them up in oil, and ended up with a pretty decent fritter. I drained them on paper towels and then rolled them in cinnamon sugar while still warm. 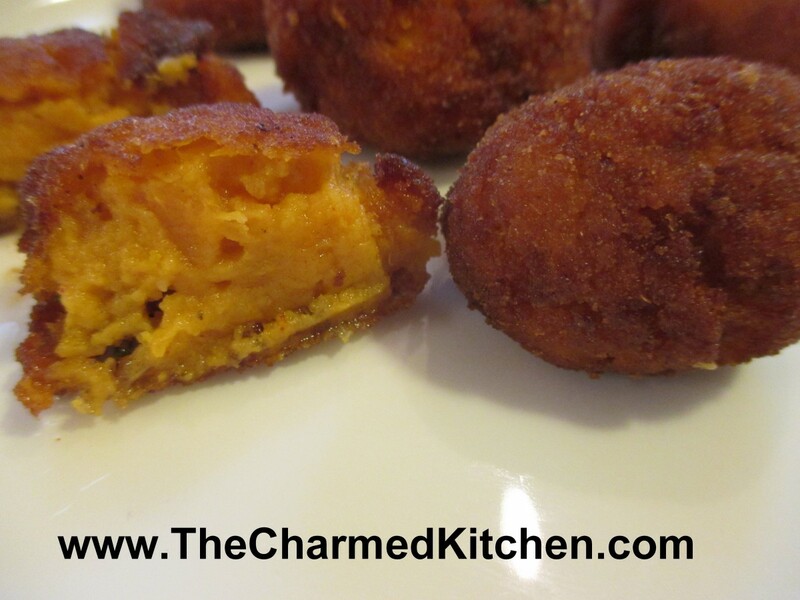 If you ever find yourself with some leftover sweet potatoes – now you have a fun way to use them. In mixing bowl combine all ingredients, except the flour and beat until smooth. Stir in flour. Batter will be thick. Heat oil to 350 degrees. 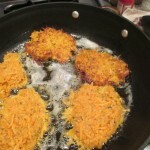 * There should be enough oil in the pan top be at least 1 inch deep- or deeper. To save oil I used a smallish pan and cooked 3-4 fritters at a time. Drop dough by rounded teaspoonfuls into hot oil and cook, turning once until golden brown on both sides. This will take about 3 minutes. 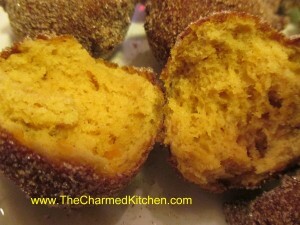 Drain on paper towels then roll in cinnamon sugar while warm. Makes 24-30. Best served warm. * Fun way to know when your oil has hit 350 degrees. Place an un-popped popcorn kernel in the oil. Popcorn pops at 350 degrees. 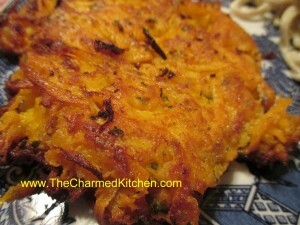 For dinner with a friend the other night I was looking for something fun to do with sweet potatoes. I have quite a few of them and didn’t want to just roast or steam them. 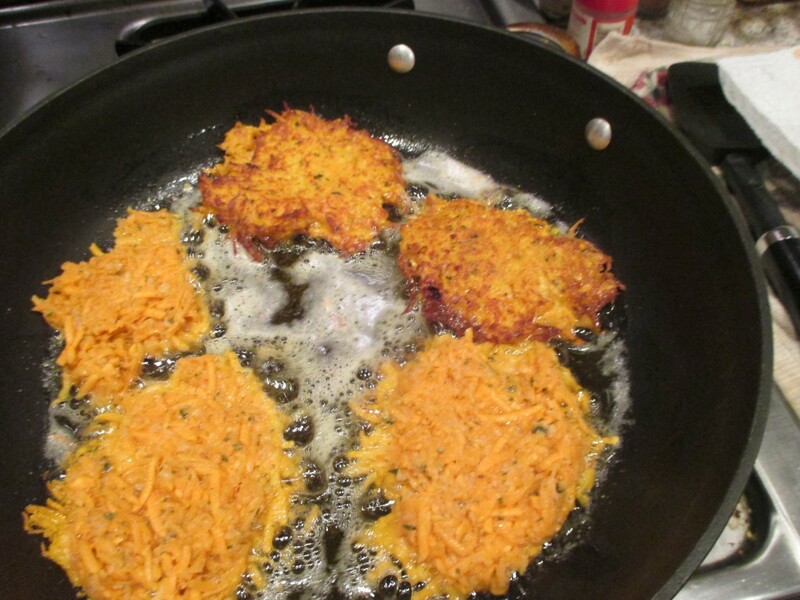 I ended up shredded them and making sweet potato pancakes. Amy had duck fat so that is what we used to fry them in. They were amazing. Crispy on the outside and tender in the middle. I am definitely going to make them again. I could see making smaller ones and serving as an appetizer. Here is the recipe. * A little trick to know when your oil is hot enough. Place an un-popped kernel of popcorn in your pan with the oil when you are heating it up. Popcorn pops at 350 degrees. When the popcorn pops – it is time to add the batter. I love sweet potatoes and am always looking for fun ways to serve them. I will admit to not being a fan of sweet potatoes topped with marshmallows. I am not opposed to sweetening them, though. 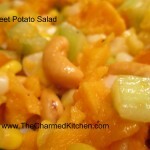 The following recipes include some simple treatments for the very versatile sweet potato. 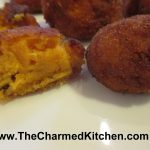 If you are looking for a fun way to serve sweet potatoes I am sure you will find a recipe here to love. This simple recipe just sweetens the potatoes a little. I think here the nutmeg is the secret to make them taste really special. Boil potatoes until tender. Drain water and add remaining ingredients. Smash the potatoes a little as you mix them. Serves 6. 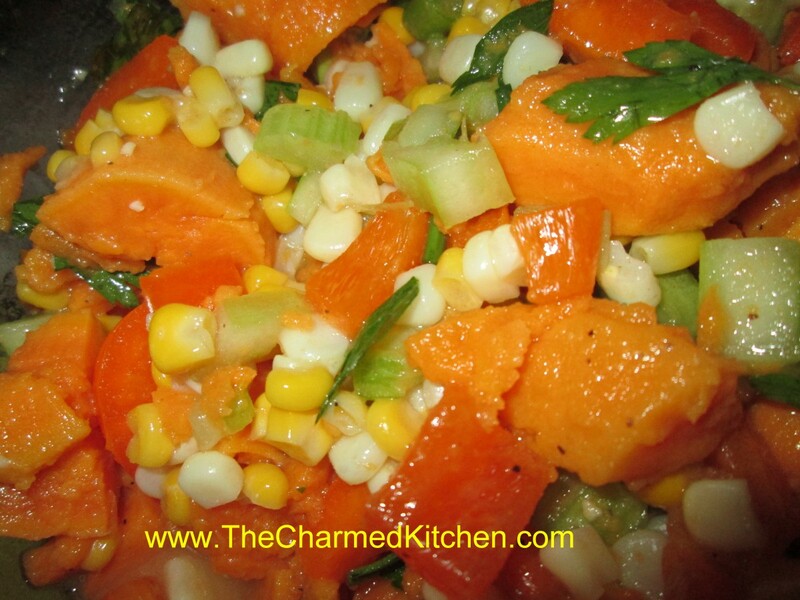 This recipe is a great side dish. Slightly sweet and just a touch of vinegar makes this a winner. Heat oil or butter in skillet and add the onion. Cook until golden. 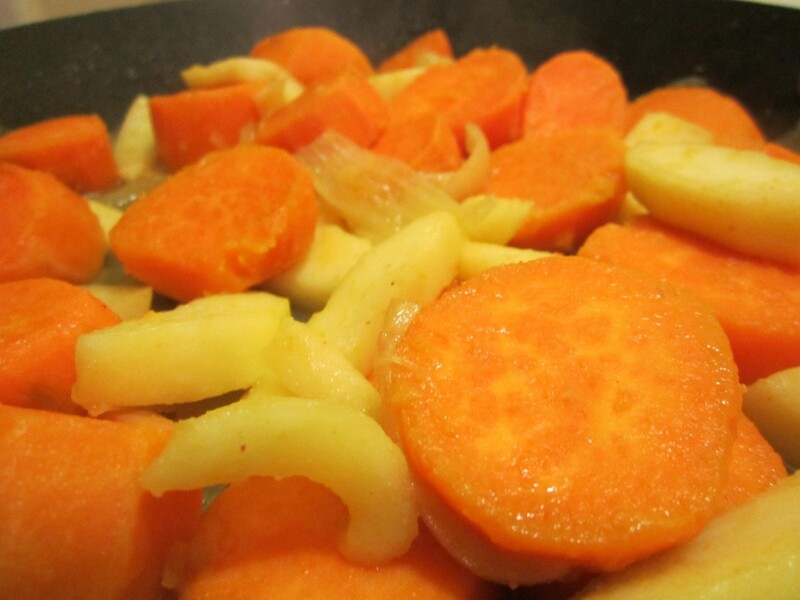 Add sweet potatoes and water or stock and cook until sweet potatoes are almost tender. Add apples and cook until apples are heated through. Add honey and vinegar and cook until most of the liquid disappears. Season to taste and serve. While I often serve this salad for summer picnics it works well any time of the year. Maybe you are looking for a different kind of biscuit. 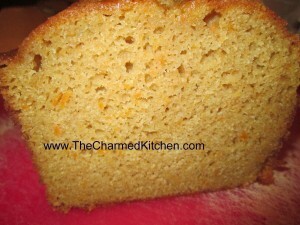 This recipe is flaky, crisp on the outside and moist inside. Always a hit when I make them. Stir together dry ingredients in large bowl and set aside. Combine remaining ingredients and add to flour mixture mixing until just blended. Turn onto lightly floured surface and knead a few times until dough just stays together. Dough will look too dry- but it will come together after you knead it. Press into an 8-inch square and cut into four squares. * Cross cut each square into four triangles. Place on greased baking sheet and bake in a preheated 425 degree oven for 20 minutes. Makes 16. * I press the dough into a lightly floured 8×8-inch baking pan and then flip it out onto the work surface. That way you’ll get nice, even edges. For when you want really simple this is the way to go. Steamed and then tossed with just butter, nutmeg and salt and pepper the flavor of the sweet potatoes shine on their own. If you don’t have a steamer, just place a metal strainer in a big pot and add an inch of water to the bottom. Cover and bring to a boil. 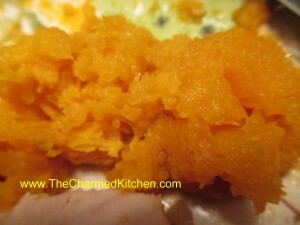 Add sweet potatoes, cover and cook until tender, about 30 minutes. 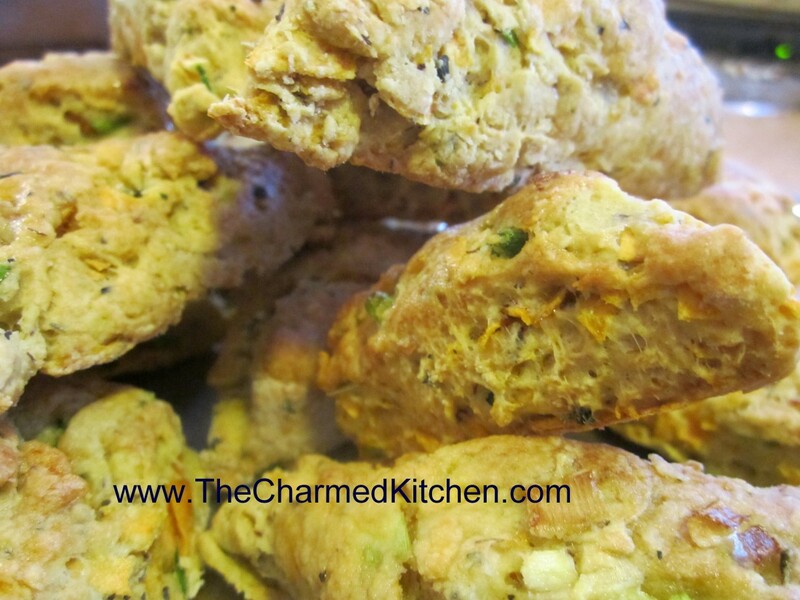 These can be done ahead and just reheated in the oven or in a microwave when ready to serve. Remove potatoes from strainer and place in a serving bowl. Season to taste and add butter. Add a fresh grating of nutmeg over the top and serve. Serves 4-6, but with a lot of other side dishes, could serve 8. Note: if you just look too forward each year to having them sweetened you can still steam them and just add 1/3 brown sugar with the butter and toss. A nice sweetener is to add a little maple syrup. To brown them up a little, place the potatoes in an oven safe dish and bake, uncovered 30 minutes to make a glaze. 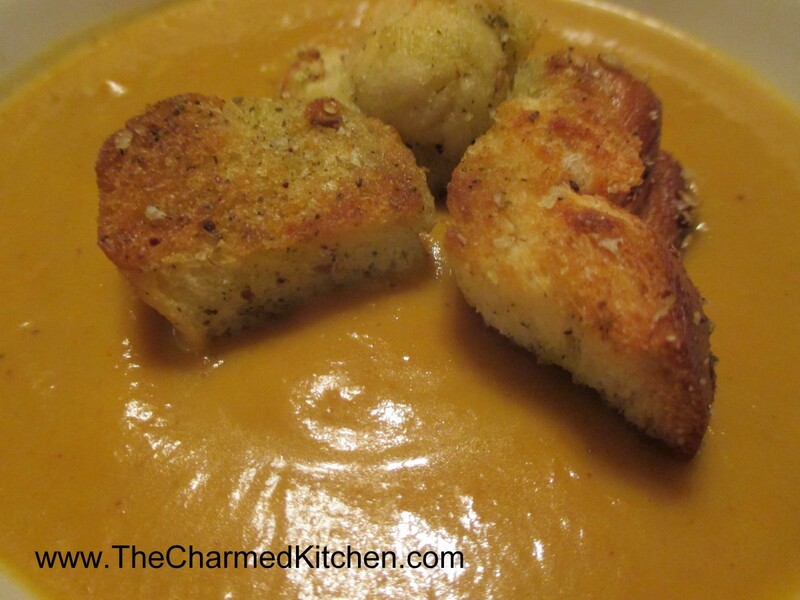 This may be one of my favorite soups yet. Creamy and flavorful it was a big hit at dinner last night. This recipe was inspired by what I had on hand and a dinner planned with friends. It started with this enormous cauliflower I had picked up at a produce market. I knew I wanted to use it. I had thought of just roasting it and having it as a side. I also knew we needed a soup for dinner. Ended up roasting the cauliflower anyway but using it as part of the soup. Added other veggies for color as well as flavor. I also made sure to get it really smooth. I used an immersion blender but it could have been processed in a blender. We topped it with croutons, but it could be served without, if you prefer. Preheat oven to 400 degree. Place onions in and cauliflower in roasting pan and drizzle with oil. Sprinkle on some salt and place in oven. Roast until veggies are turning golden brown, stirring occasionally. This will take about 20-30 minutes. 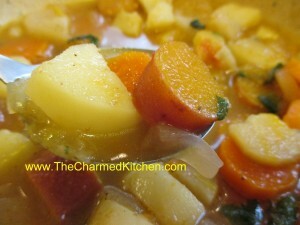 Place cauliflower mixture in a crock pot and add the stock and other vegetables and cook on high for at least 4 hours. Add remaining ingredients and puree soup until smooth. Adjust seasonings. You can add more stock if soup is too thick. Serve as is or top with croutons when serving. Serves 6-8. When the air is chilly I am always in the mood for a nice hot bowl of homemade soup. This soup came about as I rummaged through the veggie bin. I had a number of root vegetables so decided to make them the focal point. 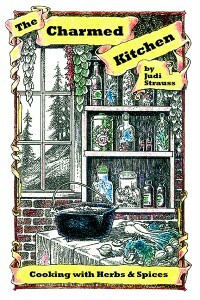 I happened to have homemade beef stock, but you could easily swap it out for chicken stock or vegetable stock as well. 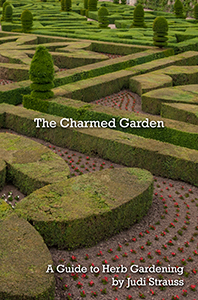 There is a part of me that wants to call it root vegetables soup- but that sounds funny. So here it it- the recipe that was created based on what I happened to have on hand. The end result was really good. 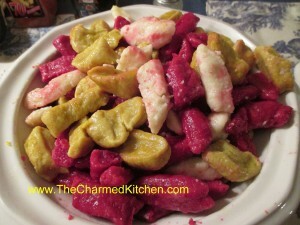 I made my classic gnocchi with potatoes and gnocchi made with beets for a birthday dinner with friends the other night. I also made gnocchi with sweet potatoes. They went well with the other gnocchi and the rest of the menu. I was using small sweet potatoes that were pretty pale once I cooked them so I added some turmeric to the dough to bring up the color a bit. That would certainly be optional. 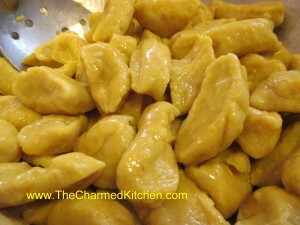 The turmeric added some flavor, but it really made the sweet potato gnocchi look great on the serving platter. Get a pot of water boiling. In mixing bowl combine the sweet potatoes with the eggs and seasonings. Add about 1 1/2 cups of the flour and stir until a soft dough forms. Continue adding flour, a little at a time, until the dough can be handled without sticking to your hands but is still soft. Take about 1/4 of the dough at a time and roll into a rope, about 15 inches long, on a floured work surface. Cut dough into 1/2 thick pieces. Place pieces in a pot of boiling water and after a few minutes the gnocchi will float to the top. Cook them for several minutes after they have risen to the top of the pot. Remove with a slotted spoon and drain. 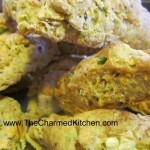 If you aren’t going to use them right away drizzle with a little oil to prevent sticking or toss with butter. You can also run a little cold water over them instead. Repeat with the remaining dough. Since the Labor Day weekend is almost here I thought I would post one of my favorite salad recipes. 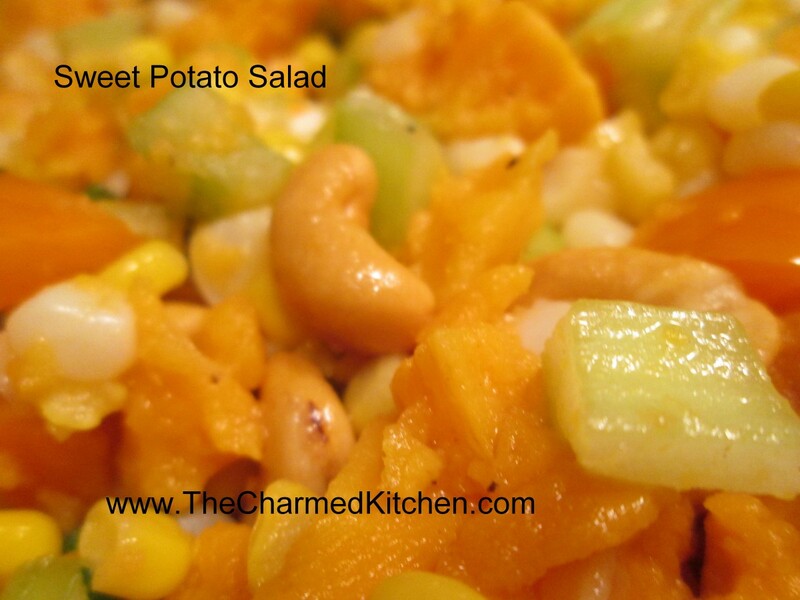 The sweet potato salad is always a hit. It goes so well with grilled foods, too. I always make a double batch – it goes fast. The tricky part is not to overcook the sweet potatoes. They cook fast. 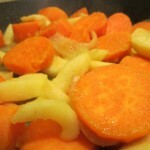 Keep an eye on them and get the potatoes into cold water to stop the cooking once they are tender.